Intensive animal farming or industrial livestock production, also known as factory farming by opponents of the practice, is a modern form of intensive farming that refers to the keeping of livestock, such as cattle, poultry (including in "battery cages") and fish at higher stocking densities than is usually the case with other forms of animal agriculture—a practice typical in industrial farming by agribusinesses. The main products of this industry are meat, milk and eggs for human consumption. There are issues regarding whether factory farming is sustainable and ethical. Robert Plamondon reports that the last family chicken farm in his part of Oregon, Rex Farms, had 30,000 layers and survived into the 1990s. But the standard laying house of the current operators is around 125,000 hens. Today, eggs are produced on large egg ranches on which environmental parameters are well controlled. 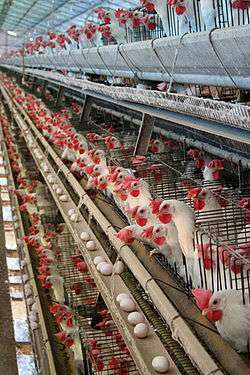 Chickens are exposed to artificial light cycles to stimulate egg production year-round. In addition, it is a common practice to induce molting through careful manipulation of light and the amount of food they receive in order to further increase egg size and production. Many countries have introduced laws to regulate treatment of farmed animals. In the USA, the federal Humane Slaughter Act requires pigs to be stunned before slaughter, although compliance and enforcement is questioned..
Cattle, are domesticated ungulates, a member of the family Bovidae, in the subfamily Bovinae, and descended from the aurochs (Bos primigenius). 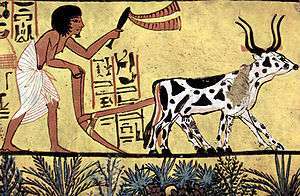 They are raised as livestock for meat (called beef and veal), dairy products (milk), leather and as draught animals (pulling carts, plows and the like). In some countries, such as India, they are honored in religious ceremonies and revered. As of 2009–2010 it is estimated that there are 1.3–1.4 billion head of cattle in the world. Once cattle obtain an entry-level weight, about 650 pounds (290 kg), they are transferred from the range to a feedlot to be fed a specialized animal feed which consists of corn byproducts (derived from ethanol production), barley, and other grains as well as alfalfa and cottonseed meal. The feed also contains premixes composed of microingredients such as vitamins, minerals, chemical preservatives, antibiotics, fermentation products, and other essential ingredients that are purchased from premix companies, usually in sacked form, for blending into commercial rations. Because of the availability of these products, a farmer using their own grain can formulate their own rations and be assured the animals are getting the recommended levels of minerals and vitamins. Cattle in the UK are mostly grass fed with the occasional extra such as a mineral lick or feed. In various jurisdictions, intensive animal production of some kinds is subject to regulation for environmental protection. In the United States, a CAFO (Concentrated Animal Feeding Operation) that discharges or proposes to discharge waste requires a permit and implementation of a plan for management of manure nutrients, contaminants, wastewater, etc., as applicable, to meet requirements pursuant to the federal Clean Water Act. Some data on regulatory compliance and enforcement are available. In 2000, the US Environmental Protection Agency published 5-year and 1-year data on environmental performance of 32 industries, with data for the livestock industry being derived mostly from inspections of CAFOs. The data pertain to inspections and enforcement mostly under the Clean Water Act, but also under the Clean Air Act and Resource Conservation and Recovery Act. Of the 32 industries, livestock production was among the top seven for environmental performance over the 5-year period, and was one of the top two in the final year of that period, where good environmental performance is indicated by a low ratio of enforcement orders to inspections. The five-year and final-year ratios of enforcement/inspections for the livestock industry were 0.05 and 0.01, respectively. Also in the final year, the livestock industry was one of the two leaders among the 32 industries in terms of having the lowest percentage of facilities with violations. In Canada, intensive livestock operations are subject to provincial regulation, with definitions of regulated entities varying among provinces. Examples include Intensive Livestock Operations (Saskatchewan), Confined Feeding Operations (Alberta), Feedlots (British Columbia), High-density Permanent Outdoor Confinement Areas (Ontario) and Feedlots or Parcs d'Engraissement (Manitoba). In Canada, intensive animal production, like other agricultural sectors, is also subject to various other federal and provincial requirements. In the United States there is a growing movement to mitigate the worst abuses by regulating factory farming. In Ohio animal welfare organizations reached a negotiated settlement with farm organizations while in California Proposition 2, Standards for Confining Farm Animals, an initiated law was approved by voters in 2008. Regulations have been enacted in other states and plans are underway for referendum and lobbying campaigns in other states. Advocates of factory farming claim that factory farming has led to the betterment of housing, nutrition, and disease control over the last twenty years, while opponents claim that it harms the environment, creates health risks, and abuses animals. Confinement and overcrowding of animals results in a lack of exercise and natural locomotory behavior, which weakens their bones and muscles. An intensive poultry farm provides the optimum conditions for viral mutation and transmission – thousands of birds crowded together in a closed, warm, and dusty environment is highly conducive to the transmission of a contagious disease. Selecting generations of birds for their faster growth rates and higher meat yields has left birds’ immune systems less able to cope with infections and there is a high degree of genetic uniformity in the population, making the spread of disease more likely. Further intensification of the industry has been suggested by some as the solution to avian flu, on the rationale that keeping birds indoors will prevent contamination. However, this relies on perfect, fail-safe biosecurity – and such measures are near impossible to implement. Movement between farms by people, materials, and vehicles poses a threat and breaches in biosecurity are possible. Intensive farming may be creating highly virulent avian flu strains. With the frequent flow of goods within and between countries, the potential for disease spread is high. Confinement and overcrowding of animals' environment presents the risk of contamination of the meat from viruses and bacteria. Feedlot animals reside in crowded conditions and often spend their time standing in their own waste. A dairy farm with 2,500 cows may produce as much waste as a city of 411,000 people, and unlike a city in which human waste ends up at a sewage treatment plant, livestock waste is not treated. As a result, feedlot animals have the potential of exposure to various viruses and bacteria via the manure and urine in their environment. Furthermore, the animals often have residual manure on their bodies when they go to slaughter. Sometimes, even "free-range" animals are mutilated without the use of painkillers. Depending on the kind of system involved, prevention and control of disease in intensive animal farming commonly use (where appropriate) several of biosecurity, sanitation, surveillance, vaccinations, antibiotics, various measures for control of parasites and other pests, preconditioning, low-stress management, and removal of infected animals. According to a February 2011 FDA report, nearly 29 million pounds of antimicrobials were sold in 2009 for both therapeutic and non-therapeutic use for all farm animal species. The Union of Concerned Scientists estimates that 70% of that amount is for non-therapeutic use. The large concentration of animals, animal waste, and the potential for dead animals in a small space poses ethical issues. It is recognized that some techniques used to sustain intensive agriculture can be cruel to animals such as mutilation. As awareness of the problems of intensive techniques has grown, there have been some efforts by governments and industry to remove inappropriate techniques. On some farms, chicks may be debeaked when very young, causing pain and shock. Confining hens and pigs in crates no larger than the animal itself may lead to physical problems such as osteoporosis and joint pain, and psychological problems including boredom, depression, and frustration, as shown by repetitive or self-destructive actions. In the UK, the Farm Animal Welfare Council was set up by the government to act as an independent advisor on animal welfare in 1979 and expresses its policy as five freedoms: from hunger & thirst; from discomfort; from pain, injury or disease; to express normal behavior; from fear and distress. Factory farming is greatly debated throughout Australia, with many people disagreeing with the methods and ways in which the animals in factory farms are treated. Animals are often under stress from being kept in confined spaces and will attack each other. In an effort to prevent injury leading to infection, their beaks, tails and teeth are removed. Many piglets will die of shock after having their teeth and tails removed, because painkilling medicines are not used in these operations. Others say that factory farms are a great way to gain space, with animals such as chickens being kept in spaces smaller than an A4 page. Less cruel methods of factory farming are still preferable. For example, in the UK, de-beaking of chickens is deprecated, but it is recognized that it is a method of last resort, seen as better than allowing vicious fighting and ultimately cannibalism. Between 60 and 70 percent of six million breeding sows in the U.S. are confined during pregnancy, and for most of their adult lives, in 2 by 7 ft (0.61 by 2.13 m) gestation crates. According to pork producers and many veterinarians, sows will fight if housed in pens. The largest pork producer in the U.S. said in January 2007 that it will phase out gestation crates by 2017. They are being phased out in the European Union, with a ban effective in 2013 after the fourth week of pregnancy. With the evolution of factory farming, there has been a growing awareness of the issues amongst the wider public, not least due to the efforts of animal rights and welfare campaigners. As a result, gestation crates, one of the more contentious practices, are the subject of laws in the U.S., Europe and around the world to phase out their use as a result of pressure to adopt less confined practices. The various techniques of factory farming have been associated with a number of European incidents where public health has been threatened or large numbers of animals have had to be slaughtered to deal with disease. Where disease breaks out, it may spread more quickly, not only due to the concentrations of animals, but because modern approaches tend to distribute animals more widely. The international trade in animal products increases the risk of global transmission of virulent diseases such as swine fever, BSE, foot and mouth and bird flu. Intensive factory farming has grown to become the biggest threat to the global environment through the loss of ecosystem services and global warming. It is a major driver to global environmental degradation. The process in which feed needs to be grown for animal use only is often grown using intensive methods which involve a significant amount of fertiliser and pesticides. 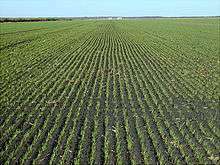 This sometimes results in the pollution of water, soil and air by agrochemicals and manure waste, and use of limited resources such as water and energy at unsustainable rates. Wikimedia Commons has media related to Industrial agriculture. 1 2 3 Kaufmann, Mark. 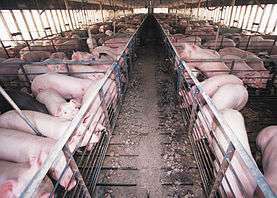 "Largest Pork Processor to Phase Out Crates", The Washington Post, January 26, 2007. ↑ "Health and Consumer Protection - Scientific Committee on Animal Health and Animal Welfare - Previous outcome of discussions (Scientific Veterinary Committee) - 17". Retrieved September 6, 2015. 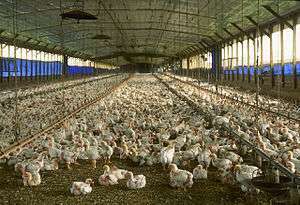 ↑ "Commissioner points to factory farming as source of contamination". July 28, 2000. Retrieved September 6, 2015. ↑ "The History of Factory Farming", United Nations. ↑ OECD, Agricultural Policy Monitoring and Evaluation 2013, 2013, p. 317, table: "OECD: Producer Single Commodity Transfers (USD)"
↑ FAO. 2007. The state of the world's animal genetic resources for food and agriculture. Food and Agriculture Organization of the United Nations. Rome. 511 pp. ↑ "Plamondon.com: the home of Robert Plamondon and all his works!". Retrieved September 6, 2015. ↑ "GRAIN — Fowl play: The poultry industry's central role in the bird flu crisis". Retrieved September 6, 2015. ↑ "BBC NEWS - Science/Nature - Reality takes wing over bird flu". Retrieved September 6, 2015. ↑ CDC H5N1 Outbreaks and Enzootic Influenza by Robert G. Webster et al. ↑ "Expert: Bad vaccines may trigger China bird flu". msnbc.com. Retrieved September 6, 2015. ↑ "China H5N1 outbreak puts vaccines under spotlight". 17 March 2006. Archived from the original on March 18, 2006. ↑ Breitbart News article Key West Chickens Raise Bird Flu Fears published April 13, 2006. Todau on line article Restoring wetlands key to curbing bird flu: UN published April 13, 2006. ↑ "Breeds of Cattle at CATTLE TODAY". Retrieved September 6, 2015. ↑ "Counting chickens". The Economist. Retrieved June 10, 2016. ↑ Lott, Dale F.; Hart, Benjamin L. (October 1979). "Applied ethology in a nomadic cattle culture". Applied Animal Ethology. Elsevier B.V. 5 (4): 309–319. doi:10.1016/0304-3762(79)90102-0. ↑ Krebs JR, Anderson T, Clutton-Brock WT, et al. (1997). "Bovine tuberculosis in cattle and badgers: an independent scientific review" (PDF). Ministry of Agriculture, Fisheries and Food. Retrieved September 4, 2006. ↑ Pollan, Michael. 2002. This Steer's Life. The New York Times. March 31. ↑ Footnote: According to legend, it was constructed by the mythical Menehune. ↑ "Oceans". Retrieved September 6, 2015. ↑ "The State of World Fisheries and Aquaculture". Retrieved September 6, 2015. ↑ "Fuss over Farming Fish, Alaska Science Forum". Retrieved September 6, 2015. ↑ This also causes stress. "Facts about Fish and Fish Farming", Advocates for Animals. ↑ University of Maine, Department of Animal, Veterinary and Aquaculture Sciences, "Sea Lice Information"
↑ Chopin T, Buschmann AH, Halling C, Troell M, Kautsky N, Neori A, Kraemer GP, Zertuche-Gonzalez JA, Yarish C and Neefus C. 2001. Integrating seaweeds into marine aquaculture systems: a key toward sustainability. Journal of Phycology 37: 975–986. 1 2 Chopin T. 2006. Integrated multi-trophic aquaculture. What it is, and why you should care... and don’t confuse it with polyculture. Northern Aquaculture, Vol. 12, No. 4, July/August 2006, pg. 4. 1 2 Neori A, Chopin T, Troell M, Buschmann AH, Kraemer GP, Halling C, Shpigel M and Yarish C. 2004. Integrated aquaculture: rationale, evolution and state of the art emphasizing seaweed biofiltration in modern mariculture. Aquaculture 231: 361–391. 1 2 3 4 "Concentrated animal feeding operations", Centers for Disease Control and Prevention, United States Department of Health and Human Services. ↑ Proposition 2, Standards for Confining Farm Animals. Retrieved August 12, 2010. ↑ "Farmers Lean to Truce on Animals’ Close Quarters" article by Erik Eckholm in The New York Times August 11, 2010. Retrieved August 12, 2010. ↑ Robbins, Ocean (November 26, 2012). "Is Animal Cruelty Doomed?". Huffington Post. ↑ McCarthy, Richard; Richard Bennett (1986). "Statutory Protection for Farm Animals". Pace Environmental Law Review. 3 (2): 229–256. Retrieved November 11, 2011. ↑ Blaine Harden (December 28, 2003). "Supplements used in factory farming can spread disease". The Washington Post. ↑ "Commissioner points to factory farming as source of contamination", CBC, July 28, 2000. ↑ Yuval Noah Harari. "Industrial farming is one of the worst crimes in history." The Guardian. 25 September 2015. ↑ "Mercy For Animals – World's Leading Farmed Animal Rights and Vegan Advocacy Organization - Mercy For Animals". Mercy For Animals. December 17, 2014. Retrieved September 6, 2015. ↑ Written Jennifer Ackerman. "Food Article, Foodborne Illness Information, Pathogen Facts -- National Geographic". National Geographic. Retrieved September 6, 2015. ↑ "Food Safety Consequences of Factory Farms" (PDF). Food & Water Watch. March 2007. ↑ "Animals Used for Food". PETA. Retrieved September 6, 2015. ↑ Dekich, M. A. 1998. Broiler industry strategies for control of respiratory and enteric diseases. Poultry Sci. 77: 1176-1180. ↑ USDA NAHMS. 2013. Feedlot 2011. Part I: Management practices on U.S. feedlots with a capacity of 1,000 or more head. United States Department of Agriculture, Animal and Plant Health Inspection Service, National Animal Health Monitoring System. 144 pp. ↑ "Home - Union of Concerned Scientists". Union of Concerned Scientists. Retrieved September 6, 2015. 1 2 http://www.kt.iger.bbsrc.ac.uk/FACT%20sheet%20PDF%20files/kt32.pdf UK DEFRA comment on de-beaking recognizing it as cruel Archived February 27, 2008, at the Wayback Machine. ↑ "Factory Farming". Retrieved September 6, 2015. ↑ DEFRA press release Archived February 21, 2009, at the Wayback Machine. ↑ "Beak trimming". Retrieved August 5, 2012. ↑ Poulter, Sean (December 16, 2011). "Pain of the pigs: Undercover filming shows animals having their teeth clipped off with metal pliers without anaesthetic". Daily Mail. London. Retrieved August 5, 2012. ↑ Barnett JL, Hemsworth PH, Cronin GM, Jongman EC, and Hutson GD. 2001. "A review of the welfare issues for sows and piglets in relation to housing", Australian Journal of Agricultural Research 52:1–28. Cited in: Pajor EA. 2002. "Group housing of sows in small pens: advantages, disadvantages and recent research", In: Reynells R (ed. ), Proceedings: Symposium on Swine Housing and Well-being (Des Moines, Iowa: U.S. Department of Agriculture Agricultural Research Service, June 5, pp. 37–44). In: An HSUS Report: Welfare Issues with Gestation Crates for Pregnant Sows, Humane Society of the United States. Archived July 3, 2010, at the Wayback Machine. ↑ The Welfare of Sows in Gestation Crates: A Summary of the Scientific Evidence., Farm Sanctuary. Archived December 23, 2007, at the Wayback Machine. ↑ "An HSUS Report: Welfare Issues with Gestation Crates for Pregnant Sows", The Humane Society of the United States, January 6, 2006. Archived July 3, 2010, at the Wayback Machine. ↑ Hickman, Martin (January 4, 2008). "The true cost of cheap chicken". The Independent. London. Retrieved May 2, 2010. ↑ "Largest Pork Processor to Phase Out Crates". Retrieved September 6, 2015. ↑ "Factory Farming: The Impact of Animal Feeding Operations on the Environment and Health of Local Communities". Retrieved December 13, 2009. 1 2 Kellogg RL, Nehring R, Grube A, Goss DW, and Plotkin S (February 2000), Environmental indicators of pesticide leaching and run-off from farm fields. United States Department of Agriculture Natural Resources Conservation Service. Retrieved on October 3, 2007. Archived January 18, 2008, at the Wayback Machine. 1 2 Miller GT (2004), Sustaining the Earth, 6th edition. Thompson Learning, Inc. Pacific Grove, California. Chapter 9, Pages 211–216. ↑ Pesticides In the Environment. Pesticide fact sheets and tutorial, module 6. cornell.edu. Retrieved on September 19, 2007. Archived June 5, 2009, at the Wayback Machine. ↑ "Factory Farming's Effect on Rural Communities". Retrieved September 6, 2015. ↑ Brown, David (October 25, 2009). "Back where virus started, new scrutiny of pig farming". The Washington Post. ↑ Food Standards Agency. "[ARCHIVED CONTENT] Food Standards Agency - VPC report on growth hormones in meat". Retrieved September 6, 2015. ↑ Schneider K, Garrett L (June 19, 2009). "Non-therapeutic Use of Antibiotics in Animal Agriculture, Corresponding Resistance Rates, and What Can be Done About It". ↑ "Denmark's Case for Antibiotic-Free Animals". CBS News. February 10, 2010. ↑ "The Hidden Link Between Factory Farms, Toxic Chemicals and Human Illness". Retrieved September 6, 2015. ↑ "H.R. 965: Preservation of Antibiotics for Medical Treatment Act of 2011". March 9, 2011. Retrieved August 5, 2012. ↑ T. Khannaa; R. Friendshipa; C. Deweya; J.S. Weeseb. "Methicillin resistant Staphylococcus aureus colonization in pigs and pig farmers" (PDF). Retrieved November 14, 2010. ↑ de Neeling AJ, van den Broek MJ, Spalburg EC, van Santen-Verheuvel MG, Dam-Deisz WD, Boshuizen HC, van de Giessen AW, van Duijkeren E, Huijsdens XW. "High prevalance methicillin resistant Staphylococcus aureus in pigs" (PDF). Retrieved November 14, 2010. ↑ Rubin, JE; Ball KR; Chirino-Trejo M (2011). "Decreased susceptibility of MRSA ST398 to tiamulin". Veterinary Microbiology. 151 (3–4): 422–3. doi:10.1016/j.vetmic.2011.03.030. PMID 21511410. ↑ "Joint scientific report of ECDC, EFSA and EMEA on methicillin resistant Staphylococcus aureus (MRSA) in livestock, companion animals and food" (PDF). June 16, 2009. Retrieved September 19, 2009. ↑ "Nationwide study finds U.S. meat and poultry is widely contaminated". April 15, 2011. Retrieved July 15, 2012. ↑ "US meat and poultry is widely contaminated with drug-resistant Staph bacteria, study finds". Retrieved September 6, 2015. ↑ David Kirby (April 28, 2009). "Mexican Lawmaker: Factory Farms Are "Breeding Grounds" of Swine Flu Pandemic". The Huffington Post. Retrieved April 28, 2009. ↑ "Is Meat Sustainable?". Worldwatch Institute: Vision for a Sustainable World. World Watch Magazine. ↑ "Facts about Pollution from Livestock Farms". National Resource Defense Council. Retrieved May 30, 2006. ↑ "NRDC: Pollution from Giant Livestock Farms Threatens Public Health". Retrieved September 6, 2015. ↑ "This Cattleman's Got a Beef". Colorado Springs Independent. November 20, 2003. Retrieved June 18, 2012. ↑ "Factory Farm Nation: How America Turned its Livestock Farms into Factories" (PDF). November 2010. Retrieved July 22, 2012. ↑ "Berlin protests focus on farming and food safety". January 21, 2013. Retrieved September 6, 2015. ↑ "Farmers defend themselves at Berlin′s Green Week - Business - DW.COM - 17.01.2014". DW.COM. Retrieved September 6, 2015.